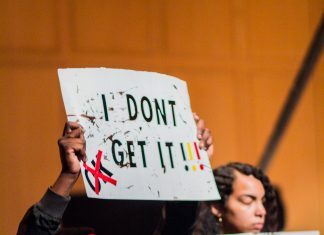 In an intimate setting on the evening of Feb. 16, members of the African American Association of Students hosted and attended a presentation aimed to spark conversations about race in the media in honor of Black History Month. AAAS guest speaker Bryant Smith spent part of his speech asking the audience to reflect on their own experiences. “Name a show that portrays black women the way you want to be portrayed,” Smith said poignantly to the audience of nine women of color in the Julian Auditorium. The room was silent in response and remained silent when he asked the same question about black men. Smith, a former educator and higher ed administrator, gave a presentation entitled “Media’s Assault on Black Images” about the discrepancies between the portrayal of black people and white people in the media. “Majority groups can get a positive self-concept no matter what form of media they turn to,” Smith said, driving the discrepancy home despite the absence of majority group members in the audience. Smith has spent the past two decades travelling around the country presenting on leadership, diversity, and student success. He arrived at the Julian auditorium after a three hour drive from his home in Kentucky dressed in a white shirt, navy tie, and dark grey slacks. Smith continued by giving examples of archetypal categories, like “Mammy” to describe Aunt Jemima, used to portray black people and white people differently in the media. “It just reiterated again to me to be cognizant of the media and the underlying meanings,” said Shirley Tandy, the AAAS executive board member who organized the event. Many members of AAAS were unable to attend Smith’s presentation due to a Posse meeting that was scheduled during the same time. However, Smith’s message targeted a broader audience than just students of color. Tandy says that AAAS is interested in co-sponsoring more events with other organizations on campus in the future to attract bigger, more diverse crowds. Ashley Jimenez, the AAAS secretary, felt similarly to Castellini. “It’s important because we need those speakers to come in and talk about the issues that are prevalent today,” Jimenez said. To end his talk, Smith focused on ways to combat the biases present in the way media portrays black people and white people. His suggestions ranged from separating one’s information from entertainment to diversifying one’s friendships. Another member of AAAS’s executive board asked Smith if he would be interested in presenting to a larger audience at DePauw’s next Day of Dialogue.